At last night's meeting of the Elk Grove City Council, Mayor Steve Ly denied that he allows men more time to speak than women during public comment. That criticism was leveled during the public comment section of the Wednesday, October 10 council meeting. 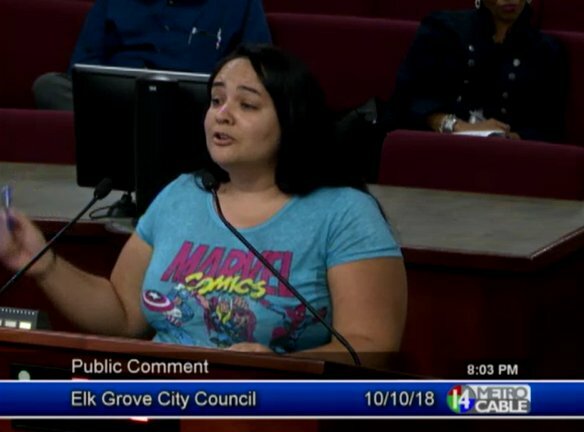 Speaking to the council, Elk Grove resident Danessa Atiles noted that during public comment, one male speaker was engaged by both the council and police staff for over 30 minutes. The extended comment period and dialogue, which started delving into policy discussions that were not on the agenda, was allowed to proceed unabated by Ly and Elk Grove City Attorney Jonathan Hobbs. By comparison, Atiles said that female speakers are regularly given short shrift. Below is an audio recording of the comments entered into the public record. In response, Ly, who as mayor conducts the meeting and the time allotment for each speaker, denied any bias against women speakers. Interestingly, a situation described by Atiles during her comments occurred during a joint meeting of the Elk Grove City Council and the Planning Commission. At that May 2016 meeting, which was conducted by then Vice Mayor Steve Ly, he rushed Elk Grove resident Lynn Wheat while allowing a real estate developer ample time - much more than three minutes - to enter their comments into the record (see video below). Confucius say, "knowing what side bread is buttered on, prevents sticky fingers".